One of the most interesting things about the growth in tailoring in recent years has been the way models have changed, split or evolved. 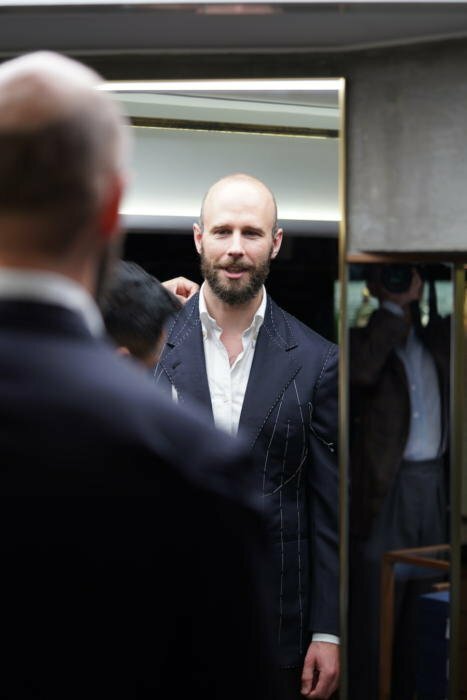 We have bespoke suits being cut in London but made in India (eg Whitcomb & Shaftesbury); we have tailors setting up foreign branches, often as bases for much broader travel (eg Huntsman); and we have new brands with a real understanding of bespoke nonetheless deciding that made-to-measure is the future (eg Anglo-Italian). This can be a little confusing for consumers, but it does make for a more energetic, dynamic market. Another one to add to that mix is students of bespoke working with cheap, local tailors to improve their style. 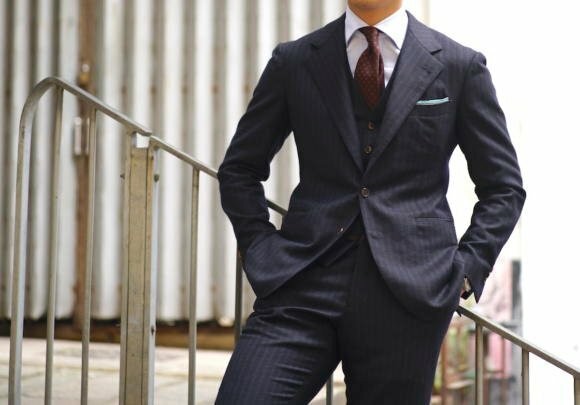 I’ve commented before that Hong Kong tailors often use a lot of handwork in their suits, yet may fuse a garment for speed, and generally lack an understanding of modern styles (whether sartorial or high street). 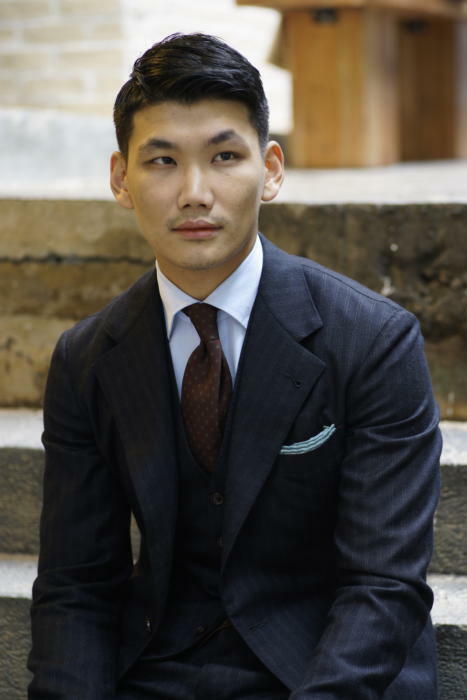 Prologue in Hong Kong was started by three guys, Chris Tang (below), Jerry Tong (above) and Maslow So, who loved the styles of many of the tailors we discuss here on Permanent Style, but wanted to find a cheaper alternative. Chris had been an Armoury customer and tried several tailors including Liverano, Panico and Corcos. He loved the styles, but couldn’t afford to have all of his suits made by these names. And perhaps more interestingly from a business point of view, many of Chris’s friends asked him for advice on getting cheaper suits, and he didn’t have anything to recommend. 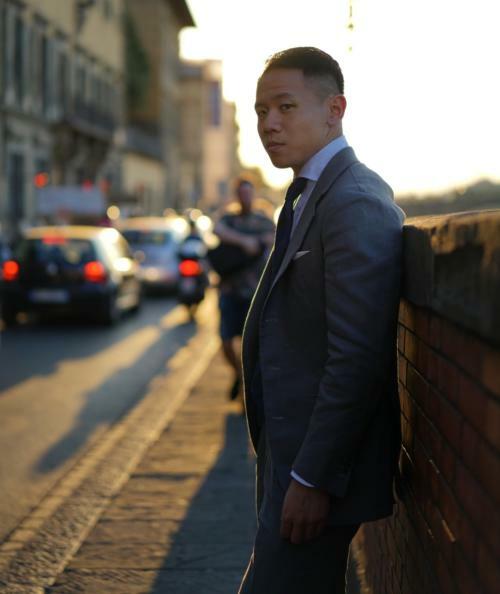 Chris and Jerry started working with Hong Kong tailors to try and get them to make more in a Neapolitan or Florentine style. But it was never worth the tailors’ time to re-think everything about how they cut and made, just for these two guys. After several failures, they found someone in mainland China who was prepared to help them learn to cut their own patterns. Many hours were spent in the evenings and weekends (they both had full-time jobs) cutting things to fit themselves - with softer shoulders, broader lapels, more open quarters. Eventually, they got something they were happy with on themselves. They tried it on a few friends, and again the results were pretty good. Those suits for friends were just adjustments to the original patterns Chris and Jerry created - and this is important. They weren’t drafting patterns from scratch, and for this reason they still don’t call what they do ‘bespoke’. The tailoring is made by adjusting existing blocks and is largely made by hand - and for this reason they call it semi-bespoke. On the hand-making point, both lapels and collars are hand-padded, but the chest is only done by hand on certain styles. These are also things the guys are still refining and improving. 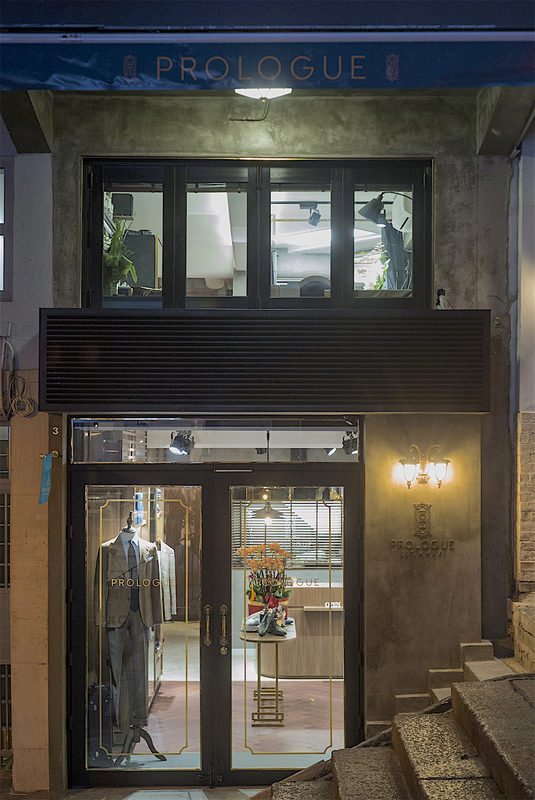 Fast forward a couple of years, and there is now a full shop called ‘Prologue’ in Hong Kong offering this affordable take on modern tailoring styles. I visited when I was in Hong Kong a couple of months ago. The name Prologue, by the way, comes from the fact the guys recognise their suits could be just the first step on a road towards bigger and pricier things. Which is nice. Suits start at £850 and take one or two fittings. The style is a mix between Neapolitan and Florentine, with a broad convex lapel, slightly low gorge and very open fronts. Most are made with a spalla camicia shoulder, although they are now also offering a standard shoulder for those that want something less unusual or more professional. There are Milanese buttonholes, but made in a slightly larger, teardrop shape. The shape is not particularly to my taste, and they are a little thick on the inside line, but it's quite distinctive. Prologue have also just started - importantly for readers of Permanent Style - travelling to London, though not that often. They were here last month, and are currently only scheduled to be back in January 2019. Alongside the tailoring they host some interesting artisans like Japanese shoemakers Bolero and Clematis, and stock shoes from Yanko. There is also a range of in-house high-waisted denim, and some particularly nice wallets made by Villys in Vietnam. These are long coat wallets, with card slots hidden on the inside so the exterior is nice and clean - and focused just on the leather. There are shoe care products from Japanese brand Boot Black (which offers a bigger range than Saphir - useful in some ways, confusing in others) and ties from Mementomori. I was measured for a jacket while in Hong Kong and will report back on the quality and fit of the service. Of the pieces I saw, I was impressed by the level of detail and handwork, although some of the fit garments varied a little in style around the collar and lapel. The latter is a result of the guys figuring out their house style over time, and will hopefully be something that settles down - along with the making points. Given how many places there now are to get good tailoring - in all those different evolving models - it’s important to be able to offer a clear and consistent service. More when the jacket is complete. You can follow the discussion on Prologue: China-made sartorial-style tailoring by entering your email address in the box below. You will then receive an email every time a new comment is added. These will also contain a link to a page where you can stop the alerts, and remove all of your related data from the site. Hi Simon, I really enjoy this kind of post – thank you. I will almost certainly never buy from these guys (both for reasons of access and of style), however as a lover of gentleman’s tailoring in its widest sense, I take joy from knowing that there are young guys opening businesses like this around the world. Unless you enter the worlds of very high or very low fashion, there is little chance of big monetary reward, yet evolution of our ‘world’ of permanent style is essential to ensure it faces a healthy and prosperous(ish) future. More posts on these new names will always be appreciated by this follower. I was interested in having a suit commissioned when they where travelling to Stockholm recently but in the end decided against it mainly because of the issues I’ve seen on many other commissions. A regular one seems to be too short side skirts, which aren’t made on purpose. This along with some issues with the sleevehead were my biggest concerns. I do like their style though, and it is very possible I will have something made once they figure out these issues. Simon, this is an interesting article in the implications it seems to give about tailoring in the future. Workplaces are becoming increasingly less formal, traditional bespoke is becoming very expensive and styles anyway are perhaps more relaxed than those tradional styles (at least the English ones). So do you see this model becoming more prevalent in future, along with the likes of P Johnson, for example or even MTM offerings from Trunk, Anglo-Italian and the like? I’ve not had anything made by them yet, but did enjoy my time there two months ago (and walked away with those blue, suede tassel loafers). Jerry was quite helpful, too. This might sound like a newbie’s question, although I’ve been reading you for years. But what in the end is the difference between this kind of mtm and full bespoke? A bespoke tailor is never going to draw an outlandish pattern, it will always be within a certain range. So do you really think that’s significantly different from adjusting a pre-existing block? By the way when do you expect the jacket to be ready? You may have already read it, by the way, but there is a basic breakdown here. Thanks, Simon. Looking forward to the review! This point of difference is increasingly untrue. The MTM service I work for has CAD patterns that can adjust for differential shoulder slope, stooped or erect posture, sway back, and more. There are still things it cannot adjust for, like sideways curvature of the spine, but why assume a human cutter can do better? One hopes that the best can, but how many are of this rank? And how many men can afford to pay for them? Although every one of us has a unique snowflake of a body, most fit issues are not that hard to fix. 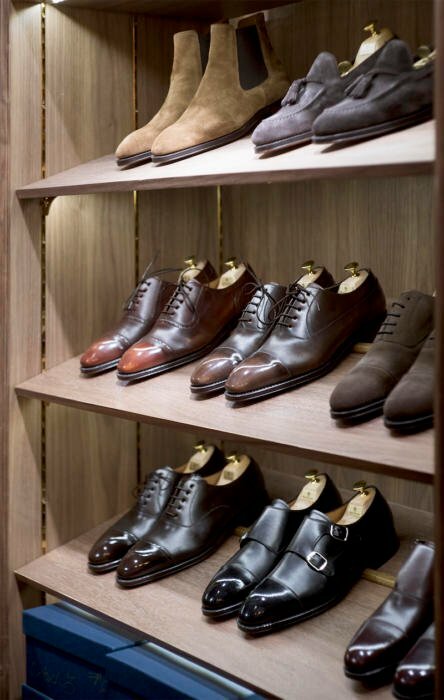 This is why, as large RTW offerings become uneconomical for merchants, and 1st class full bespoke is ever further out of reach, made to measure or ‘semi-bespoke’ offerings are claiming an increasing proportion of the market. Thanks AMS, but I do disagree. I have tried very good MTM with all these kinds of adjustments possible, and the vast majority of bespoke I’ve tried is a better fit – even on a relatively easy body shape like mine. Simon, would you say your MTM Samanamel jacket doesn’t fit as well as, say, your Caliendos or Solitos? And have you tried MTM from Eidos? Andreas Weinas’s tan suit from them (you must know which one) looks fantastic, as far as I am concerned. Overall, no it doesn’t – particularly in the bespoke aspects of fit. It’s worth buying from what I recall. It’s unclear from the post if the duo only measures and cuts patterns or also does the rest. If the latter, which factory do they use? One of the reasons I like visiting this blog is that it is calm and considered experience amidst the mayhem. Even if it does make me stress that my trousers are too long. Maybe not related to this post. I live in Birmingham, UK. I don’t believe many of the travelling tailors commit to trunk shows in Birmingham. I know London is the dominant city in the UK have you heard of any trunk shows that have or may occur here in Birmingham? Sounds like they have a good attitude towards what they’re doing. I’m curious what a mix between Neapolitan and Florentine would be exactly. Is there enough difference (considering the variety seen in both locations) to really pinpoint a style which is in between? Hi Simon, while not quite related to this post, but I wanted to ask for your view on having a second pair of trousers ordered with your suit. While it is in theory practical, as the trousers may not last as long as the jacket, this certainly add to the overall cost. 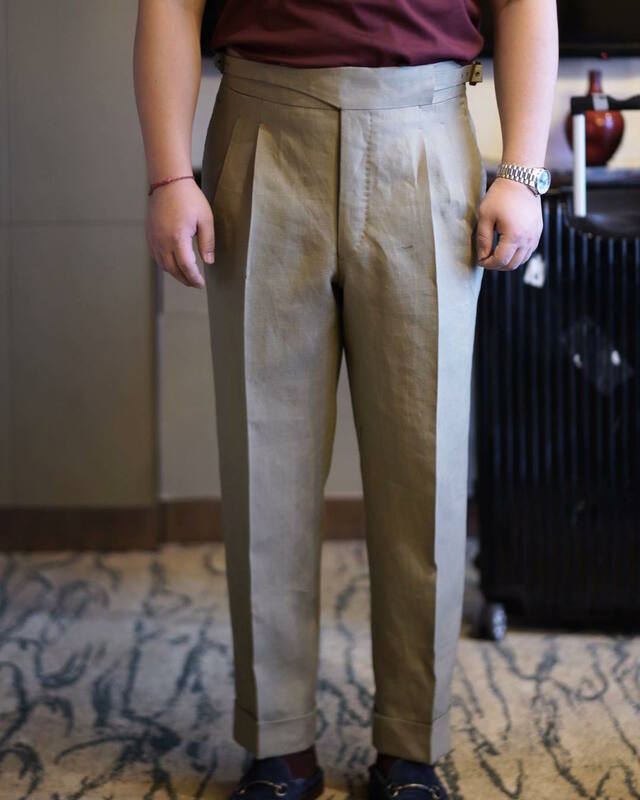 Do you ever have your suits made with extra trousers? Or it makes little sense if you rotate suits properly? Many thanks in advance! Great post, Simon. My personal experience with Prologue, unfortunately, wasn’t a good one. I emailed to enquire the price range and their house cut and never received a response. I then paid a visit to the shop myself (without an appointment) – but both the owners were cold and uninterested. Interesting to see how you appear to have a much better experience..
I’m surprised to hear you say that. I’ve been to the store twice (not buying anything) and both times Jerry was there and he was so enthusiastic about not only the stuff his store offers, but tailoring in general. I was so impressed that I went back a third time today and commissioned an Ulster coat from Yuki Inoue who is having a trunk show this weekend. I will be back at Prologue in a few weeks to commission some trousers to pair with my Ciffonelli sport coat which should be ready in Nov.
Hi Simon, I’m thinking about commissioning my first bespoke suit from Alexander McQueen. My hope is that the cutters at McQueen will be slightly more fashion conscious than some of the more traditional brands like A&S, whilst still offering the same quality and finishing (through the work of industry guru Ritchie Charlton). I have been an avid reader for years but haven’t (as far as I recall) come across any mention by you of the McQueen bespoke offering. Leaving pricing aside (I actually think that McQueen bespoke is on par with the other houses), is my intended action something that you would recommend or condone? Any thoughts or tips would be very gratefully received. Thanks in advance. No, I haven’t covered McQueen and to be honest don’t know much about the offering. But from what I do understand it is good bespoke, and as you say there is the design input as well. If you value both the bespoke and McQueen designs – and the latter is crucial to your choice – then I think this could be good. Certainly interested to hear how it turns out. Hey Simon, your article is very interesting, Thank you. I am crazy for hand made and hand cut suit and shirts. At present my tailor is Manning Company, Custom Tailor in Hong Kong. This tailor company made bespoke custom suit and shirts. I am fully satisfied with service and of course my outfits. 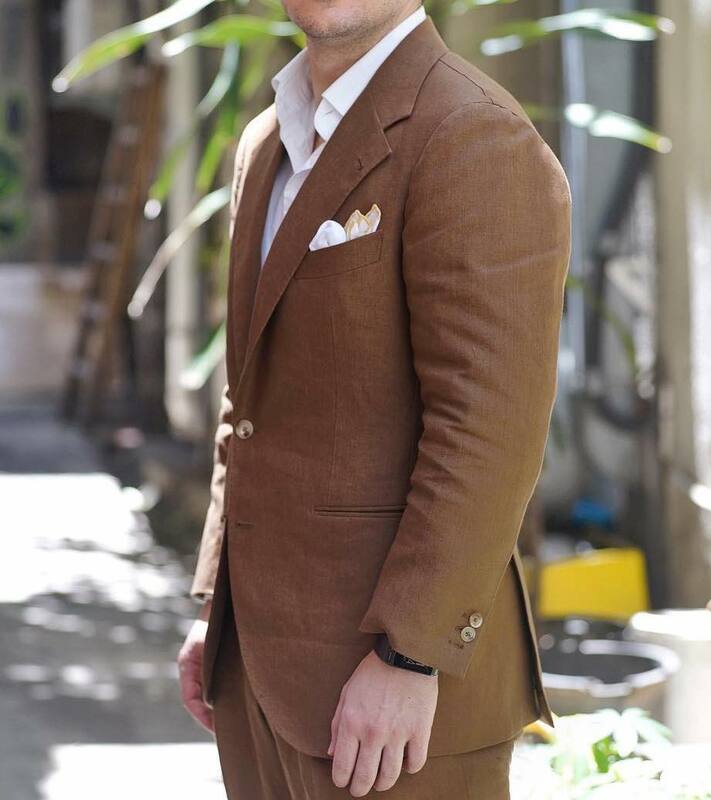 Our clothes reflect our personality, so i choose Manning company Tailor for me. Hi Simon. Great post. I had a quick question. With this type of MTM offering would they be able to make an adjustment such a raising the height of the gorge? Also, what’s your final assessment on Prologue? Do you recommend them? Is there a better Neapolitan option in HK or Singapore? Thanks for your help in advance. Yes they can. I don’t have the finished jacket yet I’m afraid so I can’t say. I was finally able to make it to Prologue. I met Jerry at the beautiful and charming store. He was excellent. He advised me patiently on the kind of fabric I should chose. He helped me navigate all the other decisions that were to be taken. Overall I was very impressed. When I asked for the gorge of my jacket to be higher Jerry reasoned that he’d prefer not to do that for a number of reasons. I preferred not to insist and deferred to his judgement. Fingers crossed the jacket comes out well. So far so good. Simon, when do you expect the jacket to be ready? I was recently in HK, the shop was unbelievably small, as is most places there due to the rent. Seems like, although with the history of British influence, more and more HK tailors/shops are gravitating to the Italian style soft construction. Understandable given the heat and humidity, a tight fitted padded armor like suit would be least on the list to wear. For Parth’s question, Attolini who is regarded as founder of Neapolitan style, visits and does MTM at Attire House…though at a cost. I think is was like $43000 HKD. I just came across your entry on these guys and unfortunately I had a very bad experience with them. I made a two-piece in their house style a while back. I guess it was a tricky piece of cloth but I was astonished as to how awful the final product came out (when it eventually did). It fell very, very far short of expectations. To be specific, the armholes were too loose on the right; the shoulders were uneven; the sleeves were poorly stitched together and the jacket wasn’t hugging my chest properly. To be fair, I do have a rather peculiar body shape and there’s only so much you can do with MTM – but the problems I just mentioned are fairly basic. The whole thing just felt rather rushed. Perhaps worst of all, the entire piece felt cheap and flimsy. This was not what I expected from a tailor shop of this reputation and price range. I sincerely hope your jacket turns out better. Thanks PS, good to know. How did they respond? Did they think it was a good fit? Yes, they did. I suspect they were blithely ignoring the problems. Due you have any experience with Tailor Made London? I’ve searched your site and can’t find anything! They boast a 3D computer scanner that can take thousands of measurements in 10 seconds on their website. They seem to have lots of good reviews also. I wonder how they’d measure up (if you can excuse the dreadful pun) to the more manual bespoke experience. Thanks! It’s just that I was reading an article in the Rake from Robert Leach author of the fashion resource book and in it he took the view that tailoring will survive. Just it will be taken up in a localised way in the same way that Barbers are now able to offer affordable wet shaves in virtually every town. Whereas once they were the preserve of a few in Knightsbridge. It seems that tailoring is one of the few other ways that can elevate a man and implementing some new type of technology could help to revive at least some of the high street which is well on the way to shutting down entirely by automation and online businesses. Just an idea Simon, if Prologue are coming to the Pop up in February 2019, have you considered having your next fitting at the pop up? I would be interested to see and I think some of your fans would to so they can see what you are judging/liking/disliking. A live fitting! Blimey, that would be pressure. Shame, it would have been interesting to see. Hi, I have tried a number of tailors that called themselves bespoke and the experience is very poor. I enjoy buying in Prologue though the price tag is relatively high considering their workshop is also in China, probably for most tailor shops in HK too. I have to be honest I was frustrated during my first few visit. There was this time when I return to try the second fitting jacket and was much shorter when it should be longer. Another time was that the fabric I ordered is out of stock and only being notified after 5-6 weeks. I wonder the problems could be lack of staffing or probably just expanding too fast, which could be common for new start up business. Nonetheless, I am satisfy with their final product. Jerry and co are willing to fix until we are satisfy which is good ! I tried on their suit and found that their house style has lower gorge compared to other houses, as evident in the last photo of yours. Wonder what your view on this is. Visually I find that if the gorge is lower, it lengthens the neckline but also makes the torso a bit shorter. I quite like it, but it is largely personal preference. I can see how it could reduce the length of the torso, but it does also make it look a little wider. Perhaps more importantly, a really high gorge looks a little dated these days.